Lima, located on the desert coast of Peru, suffers from a shortage of green areas. During the 20th century, when the city grew from one to nine million inhabitants, the construction of green areas was not a priority for Lima city planners and authorities. Lima’s landscape is gray, polluted and dry. Lima’s inhabitants live surrounded by the desert, arid steep mountains, and the sea. To find green areas to enjoy the weekend, Lima inhabitants have to travel over 200 miles. A distance like this is just too far for most people. 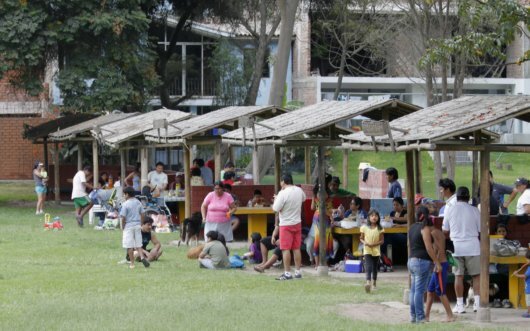 During the weekends, low and medium income sectors of Lima literally “invade” public parks or pay to have access to private green areas to enjoy a time with their family cooking and playing for a while. In Girasoles, the suburb where I live on the outskirts of Lima, we have plenty of visitors every Sunday, because of our beautiful green areas. Photo and post by Sebastiao Ferreira. This post is number 12 of 52 in Sebastiao’s 52-week photo journal.